More New styles of colors change wire comming soon. 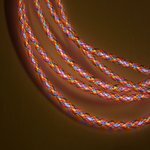 EL wire is available in all colors of the rainbow, And now we have a new color blast EL wire that will blow you away it is all one wire. Call us for more info 1-866-542-4569.
for all the burning man burners out there this will rock.